Citation Information: J Clin Invest. 2010;120(7):2575-2589. https://doi.org/10.1172/JCI41280. Cholesterol is a critical component of cell membranes, and cellular cholesterol levels and distribution are tightly regulated in mammals. Recent evidence has revealed a critical role for pancreatic β cell–specific cholesterol homeostasis in insulin secretion as well as in β cell dysfunction in diabetes and the metabolic response to thiazolidinediones (TZDs), which are antidiabetic drugs. The ATP-binding cassette transporter G1 (ABCG1) has been shown to play a role in cholesterol efflux, but its role in β cells is currently unknown. In other cell types, ABCG1 expression is downregulated in diabetes and upregulated by TZDs. Here we have demonstrated an intracellular role for ABCG1 in β cells. Loss of ABCG1 expression impaired insulin secretion both in vivo and in vitro, but it had no effect on cellular cholesterol content or efflux. Subcellular localization studies showed the bulk of ABCG1 protein to be present in insulin granules. Loss of ABCG1 led to altered granule morphology and reduced granule cholesterol levels. Administration of exogenous cholesterol restored granule morphology and cholesterol content and rescued insulin secretion in ABCG1-deficient islets. These findings suggest that ABCG1 acts primarily to regulate subcellular cholesterol distribution in mouse β cells. Furthermore, islet ABCG1 expression was reduced in diabetic mice and restored by TZDs, implicating a role for regulation of islet ABCG1 expression in diabetes pathogenesis and treatment. 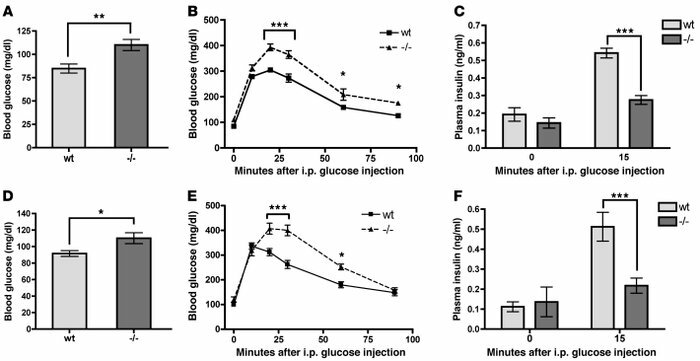 Loss of ABCG1 leads to impaired glucose tolerance and insulin secretion in vivo. (A–C) Data from male WT and Abcg1–/– mice, age 3 months. (D–F) Data from female WT and Abcg1–/– mice, age 3 months. (A, D) Mice were fasted overnight, and blood glucose levels were measured (n = 8 for males, 12 for females). (B, E) Fasted mice were injected with glucose i.p., and blood glucose levels were monitored over 90 minutes (n = 8 for males, 6 for females). (C, F) Plasma insulin levels were measured at fasting, and 15 minutes after i.p. glucose injection (n = 12–14 for males, 5–13 for females). Data are presented as mean ± SEM. *P < 0.05; **P < 0.01; ***P < 0.001.